Perfect for quick and easy weeknight meals. Serve with a salad or greens of your choice. Preheat the oven to 160°C. Place the eggs, cream cheese, milk, flat-leaf parsley and chives in a blender. Blitz well until everything is thoroughly combined and the herbs are finely chopped. Season to taste. Grease a 22cm-diameter round ovenproof pan well with butter. Heat the pan over medium heat until hot, then pour in the egg-herb mixture and add the peas to it (there is no need to defrost the peas – simply break them apart if they are frozen in clumps). Cook the frittata on the stove, without stirring, 5 minutes. Place the pan in the oven and bake, 20 minutes. 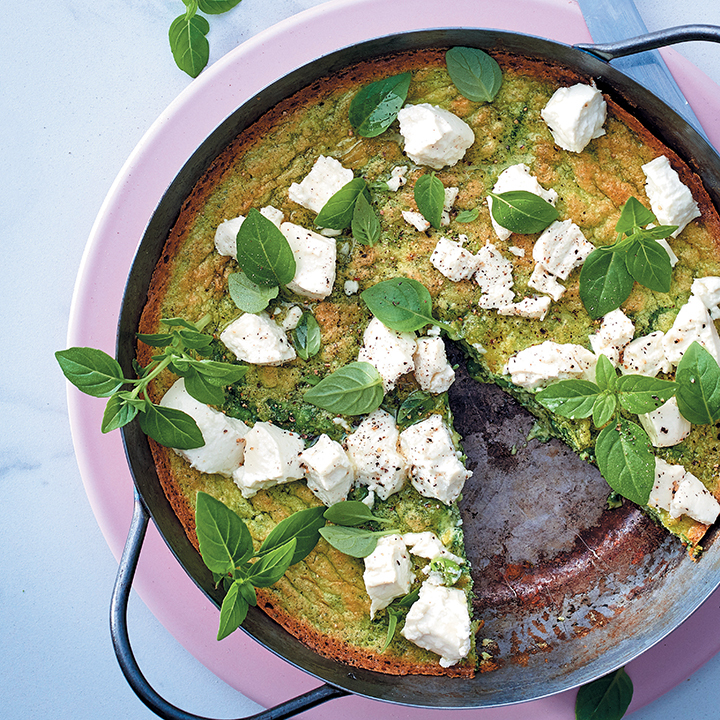 Add chunks goat’s cheese to the top of the frittata and bake, a further 10 minutes, until just set. Serve warm, topped with basil leaves and a salad or veggies alongside, if desired.